So many things to announce, how do I do it in one blog post? Let’s do a list. Drum role roll please. We’ve gotten rid of the AtD API keys. I was pushing to ask for more information and force folks to download a white paper before getting anything. Needless to say, I lost that battle. Using After the Deadline no longer requires registering with us. It’s still free for personal use. If you have a commercial need, grab our open source software. Finally, after all this time, After the Deadline’s server software is in a public subversion repository. We’ve also repackaged the current code and updated some of the documentation. Now you can check out the server software and stay in sync with what we’re using. We also have a mechanism (a local.sl file) where you can make local changes and not worry about us breaking them during future updates. Yes, now AtD speaks multiple languages. We’ve put servers in place for French, German, Portuguese, and Spanish. We have more languages ready to go and we’ll make those available in the future. We’re providing contextual spell checking for these languages. 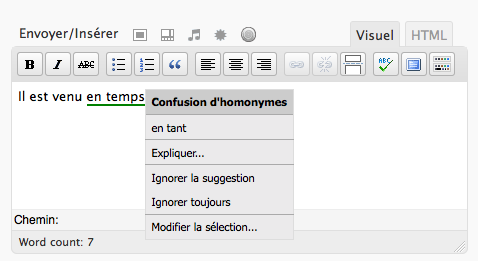 French and German have grammar checking courtesy of the excellent Language Tool project. 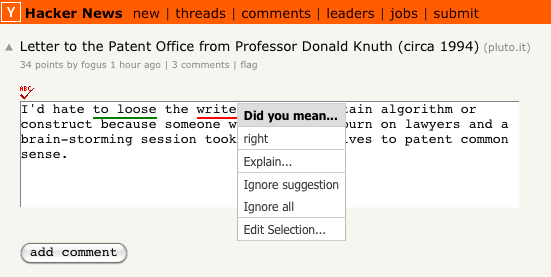 Misused word detection is under development. The AtD Language Pack on our open source server page has everything you need. As if some otherworldly power was driving him, Gautam released an update to AtD/bbPress with support for French, German, Portuguese, and Spanish on Friday. How he knew about all this stuff before us, I don’t know 🙂 But it’s great and if you use bbPress you need to get the plugin. And yes, our WordPress plugin has been updated to banish the API key nag-screen and to support proofreading in French, German, Portuguese, and Spanish. 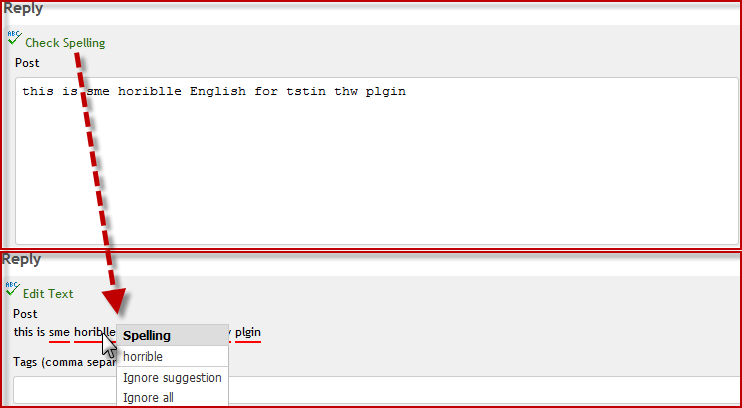 The updated WordPress plugin uses your WPLANG setting to decide which language it should proofread in. If you blog in many languages or this setting doesn’t work for you, visit your profile page (the same place where all the AtD settings are) and enable the proofread with detected language option. 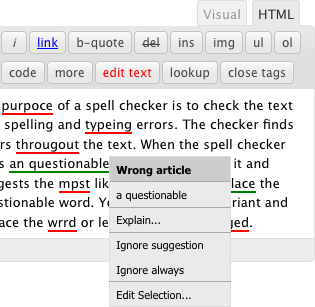 With this turned on, After the Deadline will detect your language and apply the correct proofreader to it. Thanks to the wonderful WordPress community volunteers, the AtD plugin has translations for Portuguese, Hindi, Japanese, French, Finnish, Bosnian, and Persian. I originally wanted to provide 10 exciting news items and this post became way too long with too much stuff at the top. So now you get a bonus item. We’ve also released updates to the AtD front-end components. They’re L10n ready and AtD/jQuery is now compatible with jQuery 1.4. This release adds functions for easily hooking into a TEXTAREA. I observed a few people and how they adopted the examples and decided to help them out. There are also several bug fixes and support for diacritical marks. Surprise 🙂 This update fixes several bugs and adds support for diacritical marks. Diacritical marks are those accents and marks we leave out when we’re writing words like resumé, naïve, and San José. This is common practice because most of us don’t know or can’t remember the codes to produce these marks. For proper nouns like São Paulo, a city in Brazil, it’s critical to have these marks as they are part of the proper spelling of the place. For other words the marks are optional. I can write cafe and you’ll know what I mean. But what about resume? Am I referring to continuing an action or a document that I gladly deleted when I joined Automattic? Ok, you can pick up the meaning on context. Let’s agree that resumé is prettier than resume. In the interest of correct and pretty writing, After the Deadline now helps you restore diacritical marks in your writing. 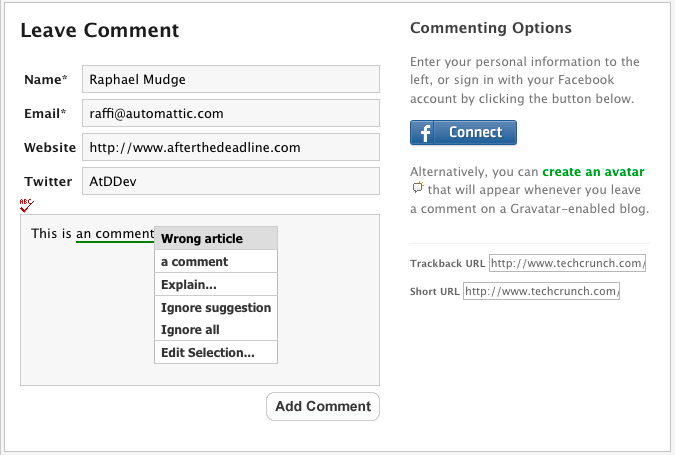 This is a style checker option that you enable through your WordPress profile. Also, After the Deadline is now better at learning words with diacritical marks. What does this mean? It means if you type Beyonce, After the Deadline will tell you it’s misspelled and suggest Beyoncé. Try it. It’s pretty cool. And, if you read The New Yorker and want to write like them: After the Deadline will now suggest a diaeresis for words with two consecutive vowels that are treated as separate syllables. This comes up for words like coöperate, reënter, and zoölogy. It’s an old pronunciation cue and I have a friend named Matt who is bound to love this feature. Now you can accent your writing with After the Deadline. Try it out at www.polishmywriting.com, download the plugin at wordpress.org, or add it to your application through our developer support. AtD now for bbPress – Thanks! Thanks to the efforts of Gautam Gupta, After the Deadline is now available for bbPress. bbPress is the WordPress take on forum software. Simple, elegant, and usable. You can find out more on Gautam’s blog or download the After the Deadline plugin from the bbPress plugin repository. AtD/bbPress uses the AtD/jQuery library. You can download AtD/jQuery and other developer goodies from the AtD developer’s page. If you add AtD to an application, let me know.